Karen Creates Cards: Merry Monday Christmas Card Challenge #106 - Use a Gingerbread man or woman on your Christmas card. Merry Monday Christmas Card Challenge #106 - Use a Gingerbread man or woman on your Christmas card. 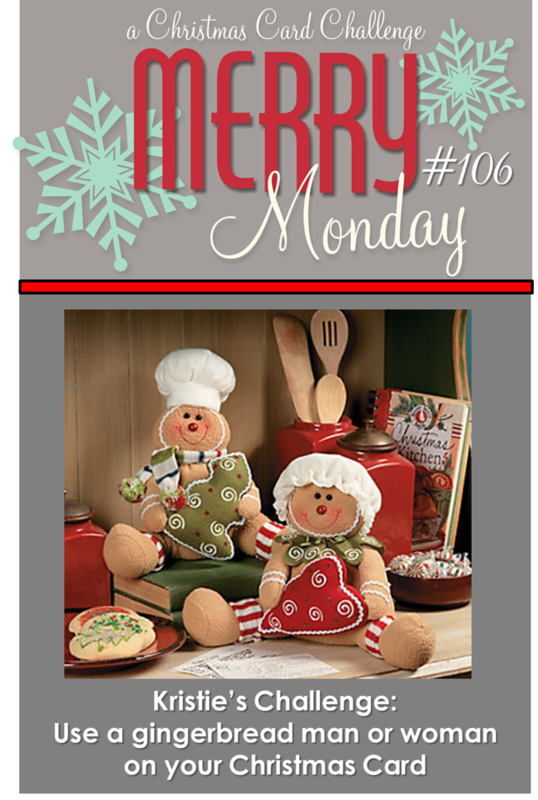 This week, the Merry Monday Challenge is to use a gingerbread man or woman on your Christmas Card. This is Kristie's challenge, have a look at the fabulous image she has chosen to inspire you. I found a wonderful, wee, free Gingerbread man here. I think he is really sweet. I coloured him up, gave him a 3D bow tie, some pearl buttons and a white gel pen, dotty edge. I loved the heart in the image so he is holding two from a SSS set of dies. The stitched circles and holly leaves are from Lil' Inker. The lacy border is a Martha Stewart punch, the wee soft leaves are a Carl hand punch, and the green DP is a scrap. The sentiment is an old Hero Arts wood stamp. Total cuteness. I love this sentiment and how you framed it. Once again wishing I could get a Rockin' the Ribbon and Twine 101 class from you, lol! A beautiful design Karen... perfect spot for that cute gingerbread man! Fabulous card, Karen! Your background of gorgeous circles and holly really makes your gingerbread man shine! I've been admiring this cute little guy and anxious to see where he came from. Thanks for the link as these are the cutest gingerbread people! You've colored him so perfectly and your layout is amazing! Have a great week, Karen! He looks good enough to nibble on! Love your rickrack trim and those sweet hearts! Very cute card Karen, your gingerbread man is adorable and the sentinent is lovely. Too cute!! Love the sentiment!! He sure is a cutie! Love the layout you went with Karen! Aww...this is so CUTE Karen :) Love the ginger!!! Love this Karen!! That sentiment is perfect for him - and the colors are awesome - WTG! Very sweet gingerbread man! Great colors and sentiment! Hope you have had a great week! Such a darling card Karen! I love the bright green paper and the ric rac! So many fun things to look at here!! Your gingerbread man looks pretty dapper sporting a bowtie, cute!